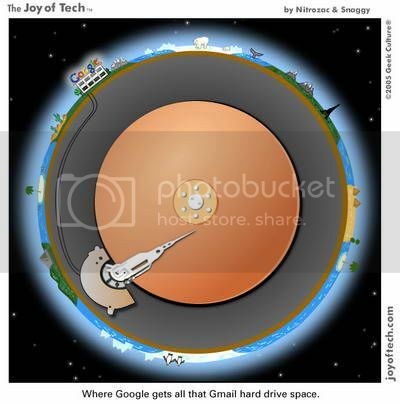 my ramblings | expressions: Age of Google: Where does the storage space come from? Age of Google: Where does the storage space come from? G is for growth. Storage is an important part of email, but that doesn't mean you should have to worry about it. To celebrate our one-year birthday, we're giving everyone one more gigabyte. But why stop the party there? Our plan is to continue growing your storage beyond 2GBs by giving you more space as we are able. We know that email will only become more important in people's lives, and we want Gmail to keep up with our users and their needs. From Gmail, you can expect more. Have you ever wondered where google store all these emails? Imagine 2 gb per person... I can only imagine the number of servers in their premise. Come to think of it, we all used to have a limit of 2mb in our free email accounts (hotmail still provides 2mb per account... #$%^&*). Do you reckon the indonesian should initiate legal proceedings against google now? He he he! Age of Google: Where does the storage space come from? Do you reckon the indonesian should initiate legal proceedings against google now? He he he!